DACmini™ CX is not just a USB D/A Converter. 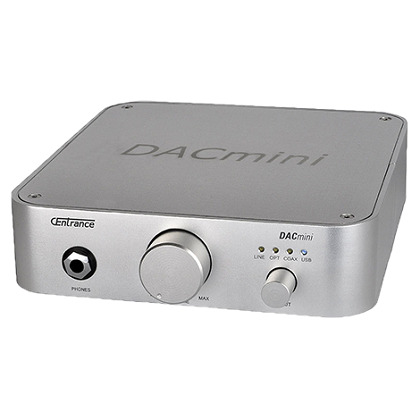 DACmini CX is one of the world’s highest-performing digital audio devices. Its precision-engineered audiophile circuitry is designed to elevate your system’s sound quality to a new level. Featuring 192kHz/24-bit performance over SPDIF and 96kHz/24-bit, driverless connectivity over USB, an analog input, and both headphone and line-level outputs, DACmini is an extremely flexible device that can upgrade the sound quality of any audio system. It easily connects to such sources as a Mac desktop or laptop (including Mac mini), Windows desktop or laptop, music server, iPod/iPhone, Apple TV, Airport Express, Xbox 360, PlayStation 3, and Squeezebox, to name just a few, providing a variety of ways to create an audiophile playback system. DACmini is designed to be the centerpiece of your digital audio system. It returns the warmth to your digital audio without being obtrusive. Our customers describe DACmini’s sound as having “Transparent highs, tight bass, and clarity in the mid-range only found in products well above the $1000 price range.” DACmini is also a versatile home audio hub, featuring a line-level input for your portable music player, an S/PDIF input for your digital sources, and a Class-A Headphone Amplifier that can drive virtually any headphones with lowest distortion. Placed near your computer monitor, it becomes the center of your desktop audio system. DACmini is a culmination of over 10 years of our design experience as a consulting pratice. When we finished designing the product, we knew that we had something special on our hands, but we didn’t have a way to communicate this to our customers until we wrote a comprehensive, 12-page design case study. This paper outlines the 10 most important DACmini features – from the design of the aluminum enclosure, to the split-ground power supply, to the custom Windows drivers. These 10 design innovations are 10 reasons to buy a DACmini today.